Structure arches - Jagram-Pro S.A.
A modern machinery park, as well as the application of high quality raw materials enable us to manufacture structural arches with a span of up to 19 m, distinguished by the high durability and quality of these elements, according to the EN 14080:2013 standard. 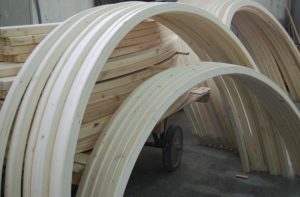 Our wide range of offered arches enables the construction of advanced and unique structures, i.e., detached houses, public buildings, bridges, terrace roofing and carports. They are also essential for roofing of shopping and exhibition arcades, as well as for roof dormers in family homes.